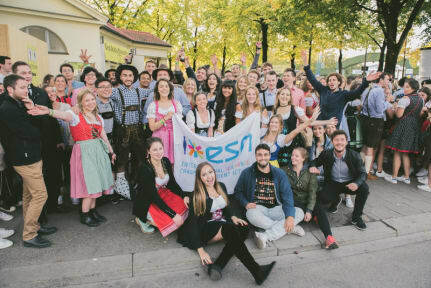 The ESN Oktoberfest campsite is the perfect way for visiting Oktoberfest as an international student. With pre-erected tents, comfy sleeping bags and sturdy mattresses you don't have to worry about anything. And in the morning we will prepare you for an amazing day with a hearty breakfast. Our experienced guides will make sure you know exactly where the best party is and during the weekends there are even after parties on the campsite (enough distance away from the sleeping tents). In 2017 more than a 1000 international students studying in the Netherlands joined, and now we are making it available for all ESN students from every country! The location is only 30 minutes away from the Oktoberfest festival and you can easily reach it with a single ride with the metro. Located in large park we a complete part of park closed of to ourselves so you'll be surrounded by like minded individuals only! Cancellation policy: 21 days before arrival. Payment upon arrival by cash, credit cards, debit cards. No extra charges for credit card. This property may pre-authorise your card before arrival.